These are Passive Circular Polarized 3D Glasses. Not 3D Active Shutter Glasses,Not Compatible with 3D active Shutter TV models. 3D Glasses for TV and Cinema - suitable for him and her. 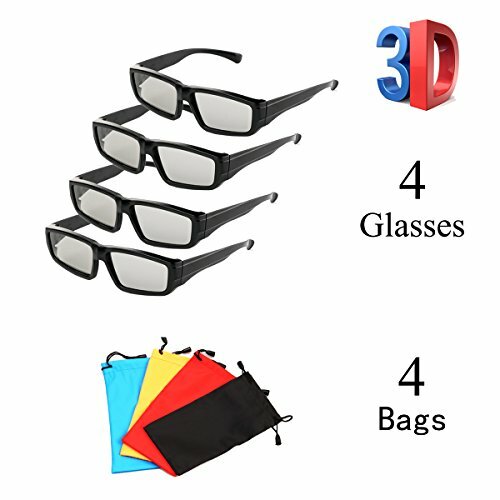 These high quality 3D glasses are the perfect addition to your passive 3D TV or 3D cinema visit. They impress with their combination of elegance and sportiness, and are comfortable to wear. When you want to experience 3D in total comfort, choose ZYZH Passive Polarized 3D Glasses and enjoy watching movies in a breathtaking new way. Please Note:These are Not Active Shutter 3D Glasses,Not Compatible with 3D active Shutter TVs and Projectors. Get 4 glasses Glasses bags for FREE (Random Color)! Almost right for all heads! Works perfectly with all passive 3D Televisions and RealD Matched to work in home or traditional 3-D theaters! 4 unisex Circular Polarized 3D Glasses for Passive 3D Televisions and Cinema!